I am really fortunate to have met Aditi Ma’am in the course of my Bachelor’s in Architecture Thesis. SCOPE OF MY THESIS. : She consolidated my idea about thesis topic. Initially I was too confused about my topic , she helped me in getting crystal clear image about SKYSCRAPER concept. WHAT TO ACHIEVE. : In starting I was puzzled on what concept I should focus on, whether it should be totally commercial or a mixed used building. But she told me in current scenario a lot of mixed land use building are under construction and many others are going to be built near future. So she convinced me on to have a firsthand idea about the mixed land use building before entering in profession. HOW TO ACHIEVE. : She told me what I actually need to learn from the CASE STUDIES. She provided me her references which really helped me out. Besides being a professional ARCHITECT she was like a friend to me, A VERY GOOD & HUMBLE HUMAN BEING. She was always there for me in ups & downs of my thesis time. Thank You Ma’am for being there by my side. I am really fortunate to have met Aditi Ma’am in the course of my Bachelor’s in Architecture Thesis. It is after this meeting that kick started my thesis journey. Without all the invaluable support and guidance which I got from Ma’am it would have been nearly impossible to complete my thesis work, starting from making a choice of the subject and incorporating the same in my design, till getting an admission in Masters Programme in Urban Design at Centre of Environmental Planning (CEPT). Not only did she help me in sailing my boat through my thesis voyage…she also helped me in landing comfortably on a major port metaphorically relating the same with my admission at CEPT, one of the most prestigious Architecture Colleges in India and of much global repute. 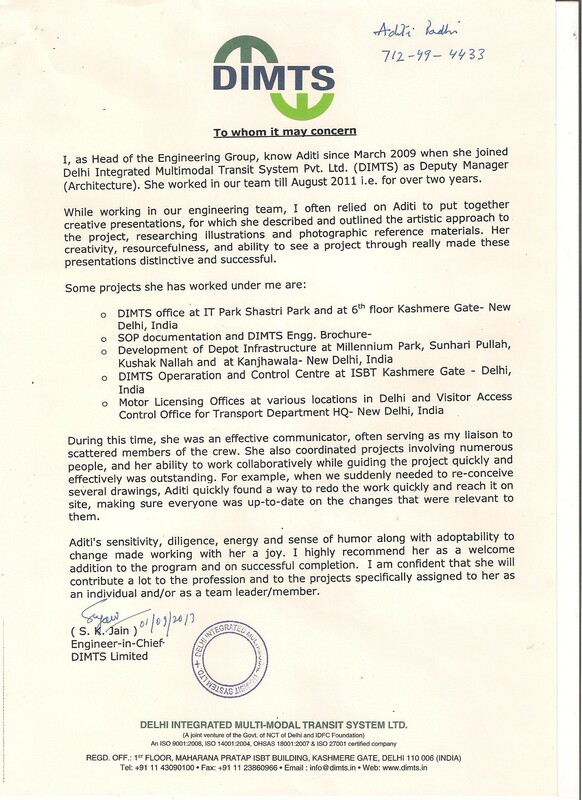 I met Aditi Ma’am during my Bachelor’s in Architecture Thesis in 2011 regarding my thesis Topic (Multi Modal Transit Hub) . Everybody says the first impression is the last impression. Regarding this I would say Aditi Ma’am proved to be a friend more than a guide. She supported me a lot during my thesis and helped me in my design process also. She also provided me with all the things especially data regarding my thesis. She worked harder than a guide normally does and above all she loves architecture very much. One thing I noticed in Ma’am that she noticed each and everything which is around us or in nature. She told me that each and every thing is designed according to human beings and their comfort . I have learnt a lot of things from Ma’am and have incorporated the same in my design also. Her design skills are very refined and her work is very impressive. She has a special quality of being a friend first and then a teacher. I am very lucky to be Ma’am’s student. 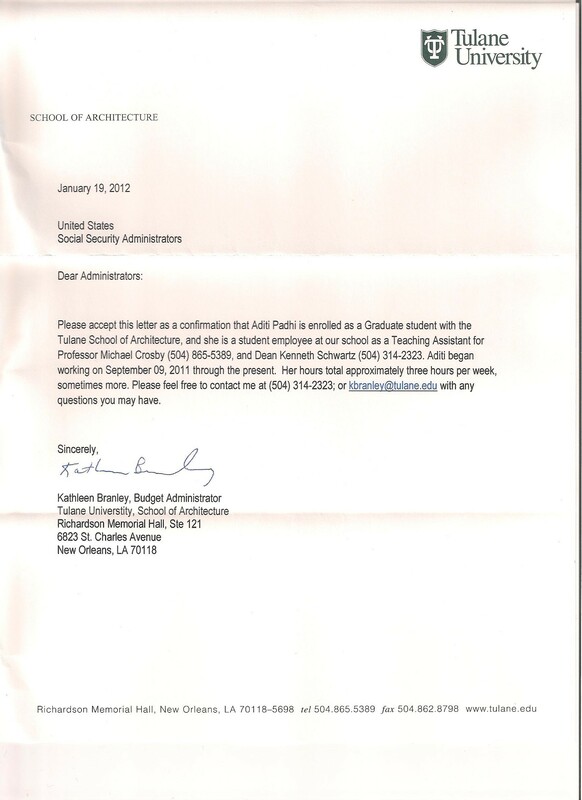 She has helped me a lot regarding understanding the profession of architecture. Thanks a lot Ma’am for being beside me and I wish to have your guidance in future too. May god bless her. Thanks a lot Ma’am’ for being my guide. 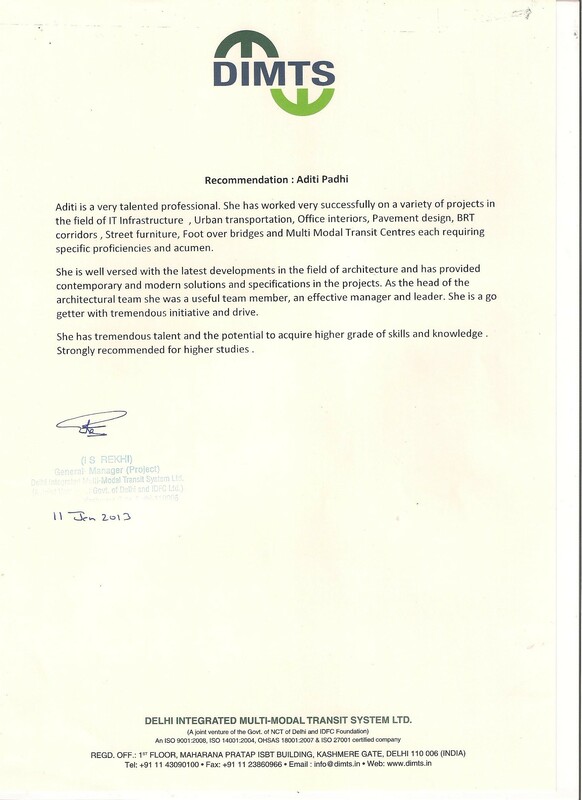 "Aditi, a great colleague who possess wealth of knowledge in her field. She always had her feet on the ground. She is an outstandingly hard working, diligent and a creative researcher. One of her best attributes is her flexibility and her keenness to share knowledge, which goes a long way in team building. Best wishes for her career." MBS School of Planning and Architecturebr> India.
" Aditi and I worked together as a faculty member in MBS School of Planning and Architecture for 6 months and it was truly an amazing experience to work with this wonderful person. She is one of the finest speakers I have had the pleasure of knowing. She was the design coordinator of 4th year and being the co faculty I really admire her lively teaching sessions that have been invaluable to the students in developing their design skills. She is sincere, inspiring and best of all highly energetic. She is always ready to provide you with a helping hand. I really thank her for her help and advice over the last 6 months; she was always informative and fulfilling. I consider her my colleague, mentor and a very good friend. I admire her to be honest and enthusiastic towards her work. She is highly knowledgeable in her field of Architecture and bears excellent design skills. She is very good in maintaining an active online presence. In short she always delivers her work with a fantastic attitude and positive energy. I will definitely look forward to work with her in future and wish her success in her future endeavours." “The role of teacher, although, is often formal but their professional duties may extend beyond formal teaching. Aditi Padhi is amongst those teachers who believe in practical education of the students. Therefore, outside the classroom, she has accompanied the students on field trips, supervising their studies, help with the organization of school functions, and serve as supervisors for extracurricular activities. But, all these things are done with due responsibility for student discipline. Her methods of teaching and her way of explaining makes the students take interest in the subject. Due to her Masters in Architecture, Aditi is well versed with the history as well as the present development in Architecture throughout the world. She is very good at quoting appropriate examples wherever required. As a co-faculty, she is more than just a colleague. Any person in her vicinity will surely be benefitted by the amount of knowledgeable interactions one has with Aditi. Lastly, I would also like to appreciate her positive way of looking at things and also her zeal for learning new things. "Aditi Maam was my Urban Design studio director in the 7th semester of B.Arch in MBS SPA, Dwarka. I had a great time in the studio and we explored design uniquely. For the first time we developed forms based on geometry and prismatic views and apertures and based on the form my functions followed the most suitable form developed. I was pushed to develop innovative structural solutions to colobrate with structures faculty and read up on Santiago Calatrava’s architecture to understand my own design better. She would appreciate and respect each and every design and would also encourage us to work hard. Whenever she could she would be an incredible resource for dissertation research, by laws and architectural literature. Wish she had joined earlier." I met Aditi Ma’am 2 years back when she interviewed me, at that time she looked unapproachable and very professional. Everybody says the first impression is the last impression so initially I was very afraid that she is very tough lady, when I join under her guidance she proved me wrong. With time Aditi Ma’am proved to be a friend more than a boss. She supported me a lot during my work at office and helped me refine my design process also. She also provided me with all the support that a new staff needs at office. She worked harder than any person normally does and above all she loves Architecture very much. She is a very keen observer and she noticed each and everything which is around us or in nature. She told me that each and every thing is designed according to human beings and their comfort. I have learnt a lot of things from Ma’am and have incorporated the same in my design also. Her design skills are very refined and her work is very impressive. She has a special quality of being a friend first and then a boss. I am very lucky to have worked under Ma’am. She was very disciplined about her work when she set a target she will successfully achieve it with excellent superiors feedback and commendable punctuality about submissions. She has helped me a lot regarding understanding the profession of Architecture. Thanks a lot Ma’am for being beside me and I wish you a bright future and successful life. I miss her lot at office as she was the only kind boss. With her dynamic personality she was very cooperative with all juniors. She has quality to convince her clients easily. "Aditi Ma’am is a successful studio coordinator of MBSSPA. From the very first day she came to our 4th year studio, her presence was established by innovative lectures on concepts, urban strategies and site analysis which was cherished by all. She always supported all her lectures with her own project works as well as literature and authors on urban design, landscape urbanism and performance spaces to name a few. She is an optimist and I am inspired by the way she can manage difficult situations. She never let me give up on my design even though developing the design with my tough scheme based on a Mobius strip sometimes seemed very difficult. She has helped me broaden the avenue of my imagination through her vast source of information on international designs, formal studies and sustainable design interventions that has motivated us all through the semester. She always maintained a one-to-one relationship during studio as well as followed up with design dialogue in emails and information on emails and kept us developing our work consistently. Her energy and good-spiritedness has allowed me to enhance my skills, she encouraged me to pursue architecture photo documentary during my vacations and emphasised the need for these skills in design. As the class monitor I shared a special rapport with her as she always gave me responsibilities with great faith and I have always tried to do my best to those tasks. I am blessed by her guidance and have learned to enjoy and appreciate my work."